It’s again time for our monthly selection of top audio branding and marketing articles of the month. For January’s ‘What are we hearing now’ we picked a few top articles from last year that are more than relevant in 2019 and three fresh prediction posts that will guide you during the coming year. 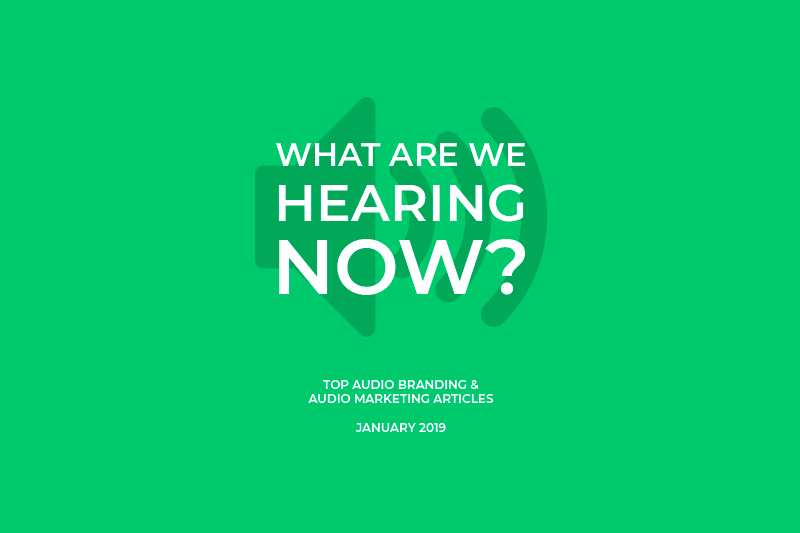 We started the year by predicting the role of audio branding to grow in brand marketing. Indeed, it looks like voice search and digital assistants really are here stay, and their sales are very likely to continue growing this year. Similarly, music and audio content consumption are growing along with video marketing content. The end result is an even more crowded visual space. Audio branding is the key to ensuring better brand recognition and recall in this expanded media universe. New innovations in technology and consumer habits are paving the way for an audio renaissance. Audio controlled devices and media are consumed in growing numbers like it is the golden age of radio again. It’s time every brand has its audio strategy in place. In 2019, recognizable audio identity will connect all your touchpoints into a multisensory branded ecosystem. Stating the obvious here, but it’s important to keep in mind that technical execution is only half of the job done. Creativity thrives also in audio advertising mediums. Eardrum’s Tristan Viney gives great key insights in producing adverts for podcasts. He also touches on the topic of the importance of audio branding and tailoring ads for each platform but still making sure that the same branded voice-over is used consistently to drive familiarity. What will we hear in 2019? Deloitte has released its 2019 predictions and is forecasting a big year ahead for smart speakers. The company projected that the smart speaker market will be worth $7 billion in 2019, a spike of 63% for total industry revenue. This kind of increase in revenue is absolutely bonkers. Better yet, it’s the biggest reason to keep a close eye on what kind of opportunities smart speakers will bring us marketers in the near future. Voice-activated technologies continue to improve and find their way into not just more homes but also cars, hotels, offices etc. Service providers need to rapidly develop new applications to monetize the capabilities within the IoT world. Digital audio mediums will be important parts of advertising strategies this year. For that, it is important to make sure the audio branding aspect is also in order. A coherent audio identity makes your brand recognizable in a screen-free environment. It helps your stakeholders reflect and connect with your brand’s identity and values on a more abstract level. This way your brand messages won’t be reduced to soulless advertising slogans. Instead, they will be presented through an emotional framework, which your customers can truly relate to.